Solar UK was chosen to install this project due to our ability to install medium sized PV systems efficiently( we also proved our adaptability for fixing PV systems to varying roof materials using specialist processes, We arrived on site and installed all the equipment in two weeks( then returned to commission the system when the electrical services had been tested. At SolarUK we are unique in that we provide solar solutions, working with the customer to turn their solar gain into Energy. We specialize in enabling customers to realise their solar potential and the real financial gains associated. 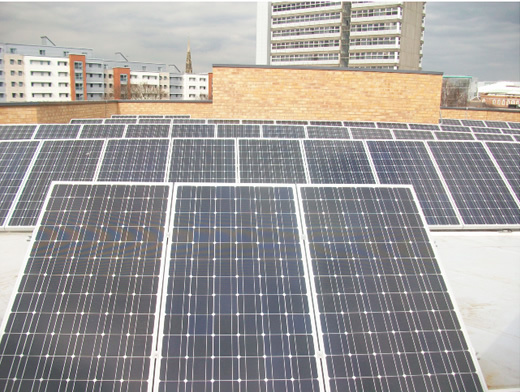 Unparalleled experience in both domestic and large scale installations, Solar UK has the expertise to tackle your energy demands. The system benefits from the Government’s Clean Energy Cash Back scheme, which started in April 2010. Under this scheme, small-scale energy producers will be offered a fixed, premium rate for renewable energy fed-in to the grid. The legislation obliges the utility companies to buy units of energy over a set number of years. For more information on the Feed-in tariffs, see the photovoltaic webpage. Solar Powered Bird Scarer, SolarUK provides the Energy! Killick House, the largest (when installed) solar water heating system in the UK.